Seven road and infrastructure projects worth Dh669 million at the Mohammed Bin Zayed (MBZ) City will be completed by the year-end, according to the Abu Dhabi Municipality (ADM). The civic body said the projects include internal roads, street lighting, electricity and communications network, sanitation, installation of traffic signs, establishment of ferries, parking lots and pavements. The municipality said the projects come within the framework of the department of municipal affairs and transport at the ADM to strengthen the infrastructure components in Abu Dhabi city, and to keep abreast of development in line with Abu Dhabi Plan 2030. Among the major projects includes the 35-Z Zone project that involves construction of an internal road on an area of ? ?1.5 million square metres in the residential areas. The project, which will be implemented in the third quarter of 2018, is located at the intersection of Al Mafraq and Abu Dhabi-Al Ain Road. The municipality is also implementing a project to support 308 plots of land in the zones ME4, ME3 and ME5. The project includes soil improvement, construction of internal roads and infrastructure. The municipality has also completed construction of internal roads and infrastructure projects in a number of new zones in Mohammed Bin Zayed city including construction of sewage services and development of electricity network, lighting of internal streets and the installation of lighting posts, walkways, cycling tracks and landscaping. "The projects reflect the municipality's commitment to provide high-class services in line with the values of sustainability in order to realise the aspirations of the community and partners," said a municipal official. The projects are also part of the ongoing development drive seen by Abu Dhabi and suburbs to meet the community needs in the area. 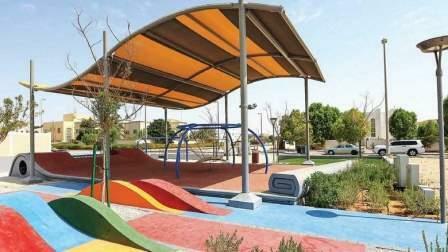 The Mohammed Bin Zayed City has witnessed the completion of several development projects during the past three years, including establishment of a park which has recreational facilities, children's playgrounds, sand dunes, shaded areas, flooring, landscaping and lighting, and serves 173 residential compounds. The municipality also completed the construction of internal roads and the infrastructure projects of residential zones (Z 17-19-20-26), which includes service roads, parking lots and other infrastructure serving 134 homes.